Used with Positive Temperature Coefficient (PTC) sensors the modules protect against locked rotor conditions, running overload and high ambient temperature. The innovative design offers additional functions as well, such as minimum off time delay, low voltage cutout and bearing temperature protection. Also the device is very safe and easy to calibrate for voltage (no jumper is required). Parts 32AA100E, 42AA100E and 50A1C1A2 are obsolete with no direct replacement. Consider the 41AA1500E with uses 3 individual PTC thermistors instead of one triple thermistor. 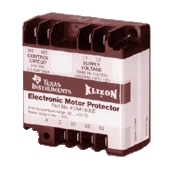 Note: These modules are no longer manufactured by Klixon. We will supply NOS when available and replacement modules when not. For above modules and other uses. Klixon no longer makes the 3BA and 4BA flat foil style sensors and we have not been able to find another manufacturer. The below PTC sensors are bead style with nominal resistance 50-100Ω for singles and 150-300Ω for triples.